FREE 8×10 Photo Print from Walgreens! Enter promo code MULTIPICFREE at checkout to make your 8×10 Photo FREE! Promo code is only valid through tomorrow, March 31st. Thanks, Free Stuff Times and Hip2Save! Amazon’s Gold Box Deal today is Stephenie Meyer books starting at just $1.99! These prices are valid TODAY ONLY (3/30) so don’t miss out on the chance to own her popular novels for under $2! These are the kindle versions, but they can be read on other devices like computers, laptops, and cell phones too! It’s never too early to start shopping for Father’s Day gifts ~ check out this Gerber Bear Grylls Compact Multi-Tool currently just $10 (normally $21.99!) on Amazon! Strawberry Shortcake DVDs starting at $4! If you have a Strawberry Shortcake fan in your house, snag some of these cute movies for as low as $4! WIN 1 Year of FREE Gas from Shell! The winner will receive FREE Gas for 1 year for themselves AND 5 Friends!!! Sweepstakes not valid in VA & NJ. Looking to make some extra money and test products for FREE? Check out Ipsos I-Say Survey company! As an I-Say member you’ll take surveys and earn rewards that can be redeemed for money ! ** IMPORTANT: Make sure you confirm your membership through the email they will send you after you sign up! $50 worth of Fisher Price Toys just $15! Toys R Us is having a 2 Day Sale + additional 25% off of select items with an Egg-Stra Bonus Pass! There is also a Buy 1 Get 1 FREE Fisher Price Promotion. When you combine the the BOGO Sale with the $3.00 off when you buy $15 in Fisher-Price items printable Manufacturer Coupon and 25% Off Toys R Us coupon you will be able to get $50 worth of toys for only $15!!! =$15.75 for more than $50 worth of toys!!! Jamba Juice Smoothies just $2! There is a new printable coupon that makes ANY sixteen size Jamba Juice Smoothie for just $2!! 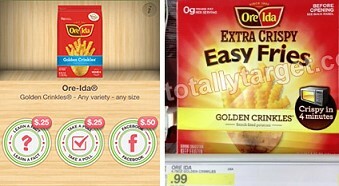 There is a HOT new offer for Ore Ida Fries on the Ibotta app – you’ll get paid $1.00 for purchasing them and the Easy Fries are priced at just $0.99 at Target which makes this purchase FREE! Ibotta is an awesome app for Android & iPhones that allows you to earn $ for shopping & you get paid through PayPal! I’ve earned over $100 by using this app and I just started using it a few months ago! The Step2 All Star Sports Climber is on rollback price on Walmart’s website! It contains a basketball hoop, rock wall, football toss, soccer goal and slide. The balls are all included too 5 star rating by over 400 reviewers on Walmart.com! Its currently priced at $69.99 (normally $99.97!) + Free Shipping or Free Site to Store Pick-up! You can get it for as low as $59.30 if you shop starting through eBates! You’ll get Free Shipping too! You will earn Cash Back from Ebates for this purchase & they will mail you a $10 Gift Card of your choice, making this purchase just $59.30 after all offers!